All-New EmuCasino Coming Soon…Now Here! A bigger, better and more exciting EmuCasino – that’s what’s new. 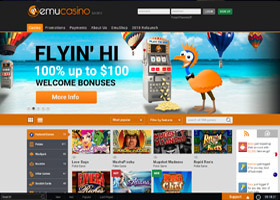 Since our launch in 2012, EmuCasino has provided players with over 500 top-quality games, an awesome user interface and a range of great promotions. In celebration of our 3rd anniversary, we thought it was right about time to offer even more to our valued customers. 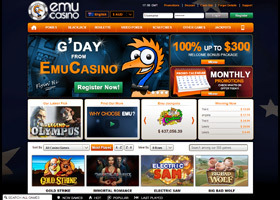 As such, on 17 June 2015, the management team at EmuGroup launched a new and improved website with a heap of extra personality that is capable of delivering a gaming experience more engaging and memorable than before! Going from a fairly old-school design inspired by the traditional Vegas style layout, we’ve brought the site design and functionality 10 years into the future with this all-new design that comes with some truly exceptional features. EmuCasino.com has made some pretty monumental changes and improvements with this relaunch; pretty much everything on the homepage, or any other page, has been overhauled with a new and upgraded look and feel. This includes a brand new and slicker logo. The search feature bar at the bottom of the old site was much loved by our players as it offered some great quick-link functionality to the user journey. The new website features this, plus a support bar that hosts additional quick-link references such as help page, FAQ, payment options, emails, live chat, time and more. If you already know what you want to play, or even if you don’t, finding the game you love is now easier than ever. Players can select the game category, theme, game providers and a whole host of specific game options including whether games feature bonus rounds, free spins and much, much more. EmuCasino introduces an all-new game play page that is far more interactive and informative, with quick links to banking options, detailed game information and helpful reviews. On top of this, there’s a bonus monitor that shows your progress through any active bonus and a news feed for overall site activity. When we say new and improved site, we mean the complete package. For those of you who enjoy a quick bet on your mobile device, you can rejoice as we introduce an all-new mobile site with game reviews, further features and a host of new mobile games. With this relaunch, we’ll shortly be introducing 3 new gaming providers to our already extensive list of games on offer – 1X2gaming, Multislot and the highly popular game provider Net Entertainment. NetEnt, one of the most popular game providers in the industry, will be pouring its plethora of online casino games on EmuCasino’s all-new site. With over 100 new NetEnt desktop games and more than 30 new mobile casino games, players will now have enough games to try something new every day. There’s no point introducing a new site with a whole range of new features and a multitude of new games to bet on, without offering a top-notch Loyalty and VIP Programme that proportionally rewards players for all their wagering. As such, we’re introducing 2 great new features that reward players for their activity and allow them to redeem their loyalty points when and how they want them.